Our goal is to create wetlands where bird life, mammals, native fish, and wetland plants can thrive. 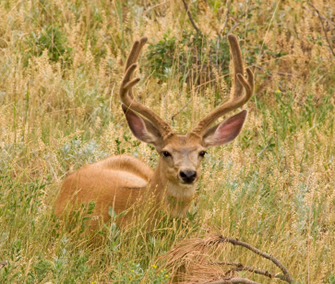 Our motivation as landowners is to restore wildlife habitat, provide wetland mitigation, improve downstream water quality and to have a beautiful piece of land in the north Animas Valley preserved in a conservation easement as a gift to our family and future generations. In 1958, when 60 horse power tractors became affordable, the wetlands were converted to hay fields. The intent of the project is to restore the land to its' historic condition. Wetlands are nurseries for native species. All life in wetlands are interdependent. In Colorado, wetland impacts are governed by Section 404 of the Clean Water Act. Animas River Wetlands, LLC will be provide a welcome solution for developers, highway departments and others who received permits to impact wetlands in other locations. The US Government requires anyone who disturbs a wetlands to replace it in the same watershed. 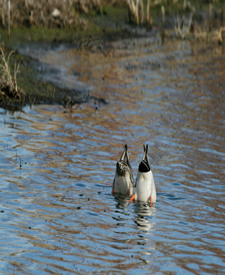 Animas River Wetlands is home to many mallards. Some mallards built nests on piles of decaying vegetation in wetlands. Hens are philopatric, meaning the hen frequently will return to the site of last year's successful nests. The female typically lays one egg per day until she has accumulated a full clutch. After the clutch is complete, incubating typically last 25-29 days. As the hatch date approaches she will begin to feign injury if she is disturbed. When water enters a wetland, much of the suspended sediments drops out and settles to the wetlands floor. A wetland's natural filtration process can remove excess nutrients before water leaves a wetlands, making it healthier for drinking and supporting plants.